Recored and mixed by Tortoise frontman John McEntire at his Soma Studios in Chicago. 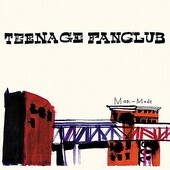 Teenage Fanclub's brand of power-pop is influenced by McEntire's penchant for avant-garde rock, though it doesn't influence it that much, as his subtle production lets, for the most part, Teenage Fanclub breathe and keep up with what they're best at: beautiful pop songs. "Only With You" shows signs of electronic implementation and album close "Don't Hide" is laid back and gentle, though the majority of the album resembles songs like the crunchy, charged power-pop of "Slow Fade", the bouncy, but subtle pop of "Now Here", and the easy-going rock of "Save". Teenage Fanclub fans will get what they expect here: a solid record of great pop songs that run the gamut from light to rocking. McEntire's influence opens up the songs a bit, to their benefit, giving Fanclub songwriters Blake, Love, and McGinley room to experiment within their own pop abilities. I'll give it a B+.